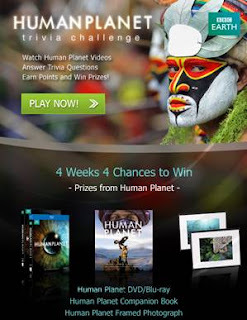 Human Planet will debut on Blu-ray and DVD April 26th, just two days after the broadcast conclusion. You can catch the series on the Discovery Channel Sundays at 8pm. 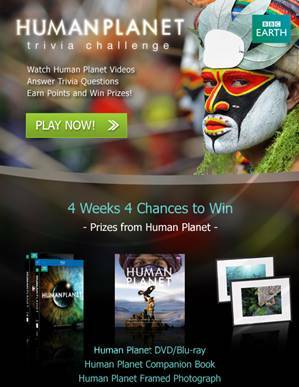 To support the series, BBC has launched an official Facebook page, featuring the new game Human Planet Trivia Challenge. Challenge friends, race against the clock, and see if you have what it takes to top the leader board. Each week we will be giving away incredible prizes including Blu-ray/DVD copies, framed photos, and award winning books. Like Them ON FACEBOOK AND PLAY TO WIN INCREDIBLE PRIZES! If you are into this kinda of series than I suggest you go join up and who knows... Maybe one of you (my wonderful readers) may be a winner. If you do win please let me know and if you want you could be a guest poster and tell everyone on my blog what you won and/or what you thought about it.